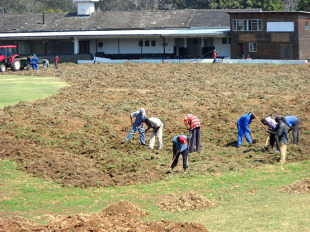 Two of Zimbabwe's main venues, Harare Sports Club (HSC) and Mutare Sports club (MSC), are set for an upgrade after Zimbabwe Cricket announced its plans to renovate both grounds. The work will see an increase in crowd capacity and an improvement in playing and spectator facilities and is the latest in a series of positive measures taken as Zimbabwe bids for re-entry into the Test arena. The project at HSC is expected to be completed before the start of the domestic Twenty20 series which is scheduled for November. The franchise-based Twenty20 cup competition was a success last season and ZC is hoping that the improved facilities will bring even bigger crowds to the game. The plans at HSC will see elevated grass embankments being constructed at the east end of the ground and the installation of floodlights for day/night matches to be played during the Twenty20 tournament and possible international fixtures. Meanwhile, the playing field and training nets field are set for a revamp at MSC in an attempt to arrest the steady decline in the quality of the outfield - that has become slow and rough - and to introduce turf nets to replace the existing artificial ones.